Lee Changho 9P announced his engagement to Cyberoro reporter Yi Doyun on Tuesday. 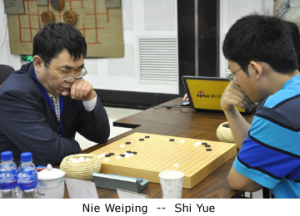 Miss Yi Doyun is a strong baduk player as well, and the couple said they plan to have between one and three children. 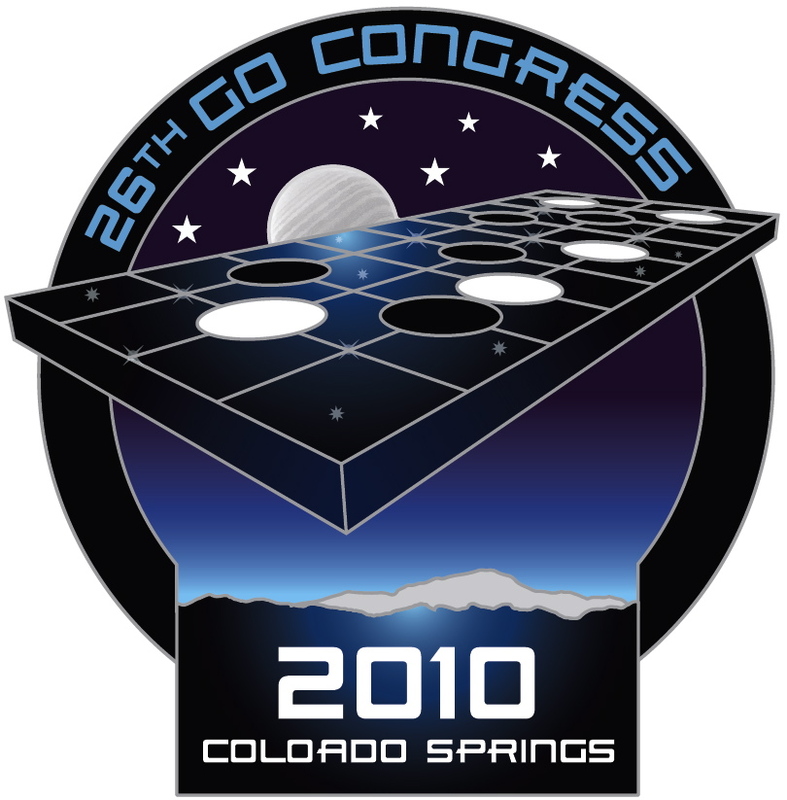 The opportunity to learn from top professional go players has always been a major attraction of the annual U.S. Go Congress, set this year for July 31 – August 8 in Colorado Springs, CO. This year’s roster of pros includes a very special visit by Yasumasa Hane 9P (right, in blue jacket) well-known as a major contributor in the development of the Chinese fuseki as well as the father of Naoki Hane 9P (far left, in tan jacket), the current Honinbo and a former holder of the Kisei and Tengen titles. 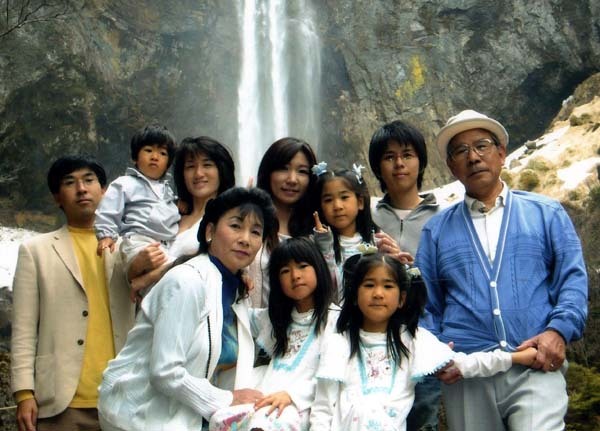 Hane’s family — wife Masami 1k (left front), daughter Michiyo Yamamori 1k (back center) daughter-in-law Shigeko Hane 1P (back left, next to husband Naoki), and Shigeko’s daughters Ayaka 1k, Ranka 1k and Rinka 4k (center) — will also be attending and playing in the U.S. Open. “It’s a great honor to host such a famous and impressively strong go family,” says American Go Association President Allan Abramson. “We look forward to learning much from the Hane family.” Also attending the Congress this year are defending U.S. Open champion Myung Wan Kim 9P (US), Seong-yong Kim 9P of Korea, Ming Jiu Jiang 7P US, Yilun Yang 7P (US), Ryo Maeda 6P (Japan), Cheng Xiaoliu 6P (China), Jennie Shen 2P (US), Hui Ren Yang 1P (US), Cathy (Chen Shuo) Li 1P (China), and Qiao Shiyao 1P (China). CLICK HERE for details and to register for the U.S. Go Congress. 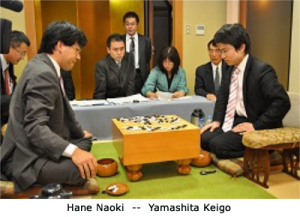 Yamashita Keigo 9P took a 2-1 lead in the 65th Honinbo Wednesday when he defeated defending title-holder Hane Naoki 9P by resignation. 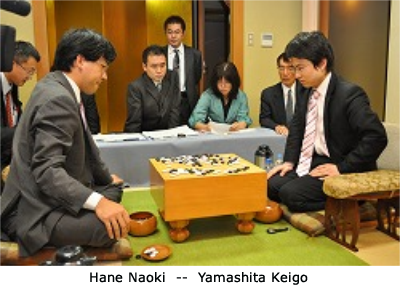 The fourth round will be played on June 17-18. 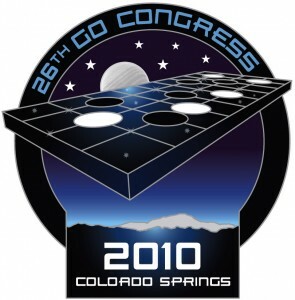 “Register for this year’s 2010 U.S. Go Congress by midnight June 30 and save!” says Congress Director Karen Jordan. Base costs increased $50 after 6/15 and will increase $75 after 6/30 and $100 after 7/17. Registration for the Congress — set for July 31 – August 8 in Colorado Springs, CO — has now passed 300, including 12 professionals, 113 dan players and 138 kyus. Click here for the latest list of attendees. The Congress website is being regularly updated with new Congress information, like the Go Congress group rate for people coming to the Congress site from Denver International Airport. Click here for the website of the Congress shuttle service; the e-mail address is aairshuttle@aol.com. You may sign up and pay online. Questions about the Congress? Click here for answers to frequently asked questions. Lee Changho 9p’s troubles continue to plague him. 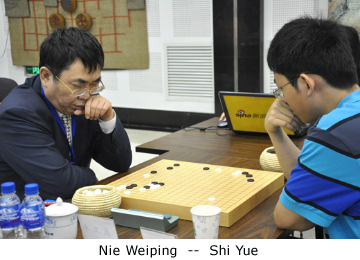 Playing in the second round of the 15th GS Caltex Cup on Saturday, Kim Junghyun 2P defeated Lee Changho 9P by resignation. Kim Junghyun is relatively new to the professional scene, turning pro in 2009 and gaining the rank of 2 dan on April 8th, 2010. Zipei Feng 7d took first place in the June 12 Rocky Mountain Spring Go Tournament in Boulder, Colorado. “We had 43 players attend,” reports David Weiss, “including five people who drove all the way from Salt Lake City, and drove back immediately after the tournament was over.” Victor Traibush 3k won 2nd place, Yun Bo Yi 6d was 3rd and Lenny Den 15k won 5 of 6 games in his second tournament to take first place in the handicap section. 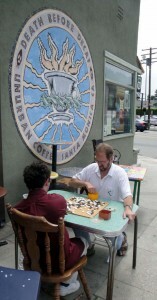 Tang Wenhua 6d (r) claimed top place in the 2010 Santa Monica Coffee Cup’s Espresso Division last Saturday after a tense final-game win over the Santa Monica Go Club’s own Yixian Zhou 7d, the 2009 US Open 6d Division winner. 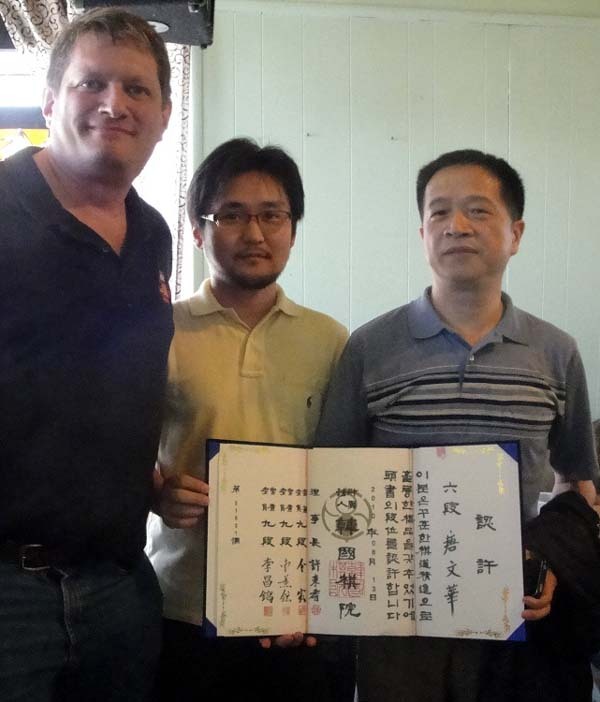 In addition to a pound of dark roast and the eponymous hand-painted coffee cup — in this year’s theme color of avocado green — Tang was awarded certification as a 6-dan amateur by the Hankuk Kiwon, courtesy of the Kiwon’s go ambassador, Myung-wan Kim 9P (center). Other winners topping the 50-player field were Tyler Oyakawa 2d in the Java (2k-2d) Division, Alex Lee 3k in the Mocha Division (3k-4k), Ezana Berhane 7k in the Arabica Division (5k-9k), David Whiteside 10k in the Cappuccino Division (10k-14k) and Jerry Lu 15k in the Decaf (15k and under) Division. The Espresso Division also served as an NAMT qualifier and eligible players will receive points toward an NAMT invitation for Congress. Joe Cepiel was tournament director. “Fifty players is a lot for the UnUrban Coffeehouse but the cool June weather made it nice and some folks took their equipment outside to play in the open air,” said organizer Andrew Okun (at left in photo at left). Next year’s theme color will be purple, Okun adds.